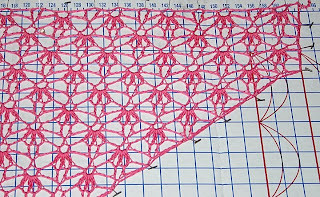 The third wedding shawl is done and blocking. 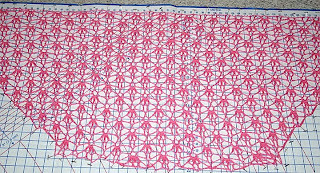 The bride didn't want the sides coming to a point, so I modified the pattern a bit before starting the decreases. All three shawls get delivered tomorrow night. Sure hope the bride likes them. 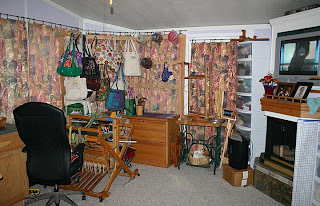 My craft room redesign is also done - a good thing since Rachel and Addy are sleeping out here while they visit for the next 3 days. 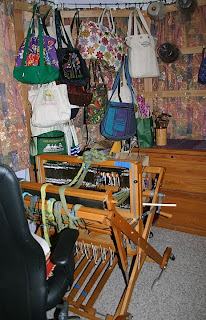 With the counter gone, I have lots more floor space - plus my new weaving corner, complete with Baby Wolf, comfy chair, and a hanging rack for coned yarn and project bags. And yes, I have a lot of bags. Some women collect shoes, something that's never interested me. But I just can't say 'no' to a project bag.